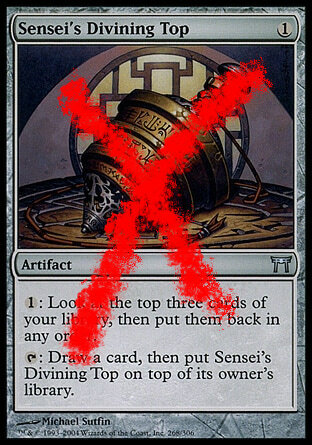 “Sensei’s Divining Top is banned.” With this simple announcement, Magic’s publisher, Wizards of the Coast, ended an era which had lasted almost five years. Since the printing of “Miracle” cards in 2012, the eponymous deck had been a dominant presence in the meta-game. Its high adaptability, largely due to getting optimum use out of Sensei’s Divining Top, made Miracles seemingly immune to the usual meta-game shifts. If you wanted to win a tournament, Miracles was always a deck to beat. In Sensei’s Divining Top, Miracles loses its most important asset. Technically, the reason for the ban was not its meta-game dominance, but rather that the card ability was slowing down tournament play too much. Still – most high-profile players seem to agree – the ban essentially means the end of Miracles. A vindication to some, a catastrophe to others – and only a week later, Germany’s largest Legacy tournament, MKM Series Frankfurt, was set to happen. Which deck to choose ? Which meta-game to expect? However, it is worth keeping the inertia of the format in mind. Most people can not uproot their entire strategy within a single week, for reasons related to time issues, card availability, or personal preference. Every discussion of the meta-game has to come with a disclaimer that said meta-game is always in flux and that some results may not manifest for months to come. The options of dealing with the ban’s fallout soon boiled down to three main avenues. Let’s try to examine those three. The results will double as a lesson in crisis management. Before MKM Series Frankfurt, several “Not Quite Miracles” lists made the rounds. 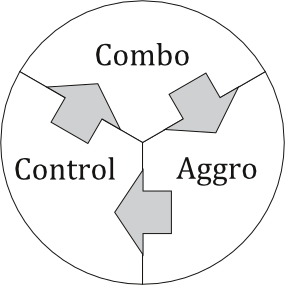 The loss of a key card, they wagered, could be compromised by doubling down on one of the signature strengths of the deck – control. In essence, these lists tried to compensate flexibility with additional value. Some former Miracles players put their hopes into these lists, not having the luxury to assemble and learn another deck within less than a week. Replace Sensei’s Divining Top and carry on? For now, the results from Frankfurt have provided a clear answer. “Not Quite Miracles” was not able to place well, nor did it have a profound impact. Without Sensei’s Divining Top, the deck is missing the necessary cohesion to be a contender right now. Numerous players tried preparing for a meta-game that did not exist yet. In order to do so, they had to anticipate future developments and strategies. This mainly concerned the more conditional sideboard plans, some of which were in the air due to Miracles’ sudden disappearance. 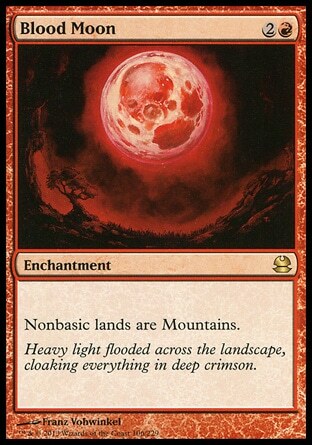 Some of these ideas were fruitful; for example, many players correctly assessed the need for responses such as Containment Priest or Blood Moon. Others, such as Cursed Totem or Perish, proved to be dead ends. The main problem when trying to construct a meta-deck remains the same: the meta has to cooperate. Each player will know the feeling of over-adjusting to a meta development and thereby ruining his core strategy. If you play against the meta, you always play against yourself as well (more on this later). The last option, which of course was not really an option for former Miracles players: Changing as little as possible. The first Legacy events in Frankfurt were set to begin only 96 hours after the ban – what kind of well-thought-out changes to the deck might be made during this short timeframe, anyway? Players following this train of thought only reduced or replaced those cards that had provided a counter to Miracles – and sometimes not even those, conscient of other matchups in which they would help (such as Pithing Needle, which can also counteract Sneak Attack). After all, cards that are only useful against a single deck are not that strong in Legacy anyway. A short aside: In 1981, Alain Ledoux hosted an unusual prize competition. The winner would be the person who guessed the number closest to two thirds of the average of all guesses. The underlying problem is apparent: every guess influences the average, in turn prompting a move in guesses. If you suspect that the average of guesses between 0 and 100 will be 50, your ideal guess would be 33.3. However, if every participant thinks this way, your ideal guess shifts to 22.2, followed by 14.6 etc. This thought experiment, which belongs in the realm of economic game theory, is often used to illustrate depth of reasoning. So how is this related to Magic at all? Meta-gaming is comparable to Ledoux’ contest in several respects – first, it represents every individual strategy being part of the larger pool. Second, it illustrates the difficulty of betting against the field or trying to outsmart it. Your own strategy will always be part of the meta-game and has to anticipate others reaching the same depth of reasoning and thus the same conclusions. So, which deck to choose – the meta-deck or the meta-meta-deck? Also, unlike Ledoux’ simple numbers game, Magic possesses a rock-paper-scissors meta-game: Shifting my position on the decision matrix makes you more vulnerable to certain counter strategies. Essentially, these results mean that strategies which had been successful before continued to be successful in Frankfurt. In the short term, the ban did not reorder the meta-game, it just eliminated the top position. In this respect, Option C led to the most immediate success for those who could afford to take it. The winner, by the way, switched from the now-dead Miracles to a rather conservative Sneak and Show list. In addition, several experienced players were able to place well despite playing decks which had not been relevant for a while (such as Jund or Canadian). Faced with an uncertain meta-game, these players chose a strategy they felt comfortable and experienced with and were rewarded for it. I would not be surprised to see them switch back to other strategies once the meta-game settles down and starts producing real data. As mentioned above, the Legacy meta-game will probably take months to settle down. But within a few weeks of tournament, solid data on where the meta-game is headed should be available. For now, it sure looks like in the absence of the strongest Control deck, Combo is the new king with five out of Frankfurt’s Top 8 decks. This in turn could strengthen other Control strategies which had no place in the face of Miracles’ dominance, and leave Aggro as the odd man out for now. Good players do not need to be prophets. They need to be able to read data. In the event of cataclysmic change, there is no shame in running a conservative, stopgap strategy until new data is available. The sheer amount of actors produces data of its own; there is quite simply no need to predict it if you know how to read.